A Mercury outboard maintenance schedule is a plan of action for carrying out a process of maintaining or preserving a boat motor based on the manufacture specifications. It’s a written plan of procedure that lists a series of things to be done to the motor at or during a particular time or period. Performing regular maintenance to your Mercury outboard motor is critical. It’s estimated that 73 percent of engine repair work can be avoided by following the maintenance instructions in a repair manual. Moreover, an outboard motor should never be left sitting dormant for an extended period of time (six or seven months). Always refer to the service manual’s inspection and maintenance procedure section if a motor has been sitting for this long. Only when a routine maintenance program has been implemented can the boat owner expect to attain satisfactory performance at minimal cost. Keep in mind that postponing scheduled maintenance can result in a snowball effect. 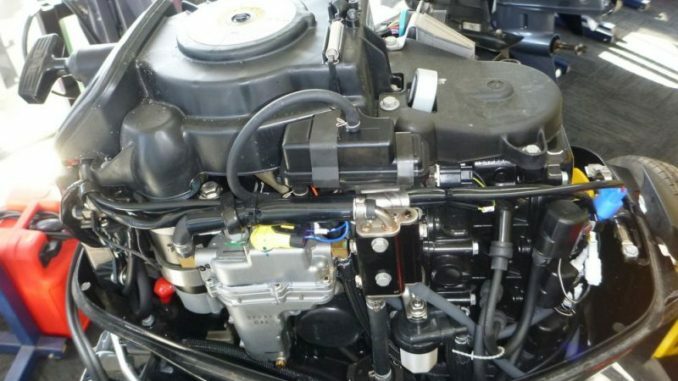 In the example of a blown head gasket, which can be a relatively cheap repair job, can develop into sever engine malfunction and require complete engine overhaul to fix the motor. Follow this inspector and maintenance guide so as to extend the life of the motor and help you avoid major overhaul and repair work. Ensure the lanyard stop switch is in working order and stops the engine. Visually inspect the condition of the fuel system for deterioration or leakage, repair if necessary. Ensure the outboard is fastened tightly on transom. Check Mercury outboard steering system for binding or loose components (on applicable models). Visually inspect the outboard’s steering link rod fasteners for proper tightness, refer to repair manual for more information. Check the outboard’s propeller, visually checking for damaged blades; e.g. cracks, chips or bends. Always flush out the Mercury outboard’s cooling system after each use if the motor was being operated in salty or polluted water. If the engine was being operated in saltwater, wash off all salt deposits with a high pressure hose. Be sure to flush out the exhaust outlet of the propeller and gearcase using clean fresh water. Lubricate all lubrication points, refer to your Mercury outboard repair manual for a list of lubrication points. Lubricate more frequently if the motor is used in salt water. Inspect and clean spark plugs. Replace broken or worn spark plugs. Check fuel line filter for contaminants; e.g. grime, water etc. If the motor is hesitating when accelerating, bogging or experiencing poor fuel consumption, check carburetor adjustments, if required. Check corrosion control anodes. Check more frequently if the motor receives a lot of abuse or when used in salt water. Drain and replace gearcase lubricant. Ensure there is no water in the gear case when changing it. Electric start models – Inspect condition of battery; e.g. state of charge, expiration date, etc. Use Power Tune Engine Cleaner to remove engine grime or deposits. Check tightness of bolts, nuts, and other fasteners. Refer to repair manual for factory torque specifications. Clean fuel tank pick up filter. ∗ These items should be serviced with the help of a repair manual. Always use a Mercury 40hp repair manual when performing maintenance to your Mercury outboard motor. More advanced maintenance procedures are listed in the manual. Does this apply to my 50 horsepower mercury outboard?